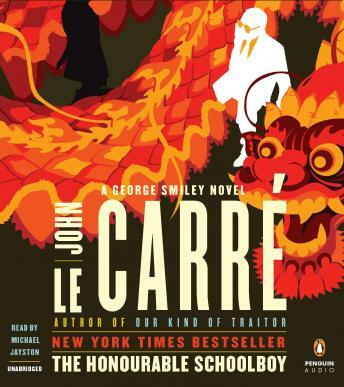 Featuring George Smiley, The Honourable Schoolboy is the second installment in the renowned Karla Trilogy, the follow-up to the New York Times bestselling Tinker, Tailor, Soldier, Spy, which was the inspiration for the Oscar-nominated film starring Gary Oldman as George Smiley, Colin Firth and Tom Hardy. As the fall of Saigon looms, master spy George Smiley must outmaneuver his Soviet counterpart on a battlefield that neither can afford to lose. The mole has been eliminated, but the damage wrought has brought the British Secret Service to its knees. Given the charge of the gravely compromised Circus, George Smiley embarks on a campaign to uncover what Moscow Centre most wants to hide. When the trail goes cold at a Hong Kong gold seam, Smiley dispatches Gerald Westerby to shake the money tree. A part-time operative with cover as a philandering journalist, Westerby insinuates himself into a war-torn world where allegiances—and lives—are bought and sold. This is a great example of Le Carre's craft - a detailed, atmospheric read that still manages to stay focused on the narrative. Some of his books tend to get bogged down in side plots, or else the author meanders through his own characters' interiority too intensely for readerly enjoyment; but he manages to negotiate both the demands for a good story and literary intelligence seamlessly.